It was the farmer’s worst nightmare, keeping entire fields unplowable and unplantable for sometimes as much as a month or more as it thawed. It was the one key reason that Vermont’s growing season was shorter than the line at a kissing booth manned by a grouchy eighty-seven year old with ill-fitting false teeth and serious bad breath. I have really, really been enjoying this whole series. And George will be visiting the blog shortly so keep an eye out. It’s mud season in Vermont and a busload of school kids have found a dead body encased in it! Welcome back to The Falls! There are several new characters, and all the old familiar ones you’ve come to know and enjoy. Visit Dream Rides: Where the Adventure of a Lifetime Begins! Come and have tea with Ducks and Puddles, stop by the Whitfield Family Compound and buy a painting from charming Louisa May McFadden. Follow Sheriff Cash Green, Deputies Ericka Yamato and Horace Scofield, Doc Stone and Meg Monroe as they work together to find out “who dunit”. 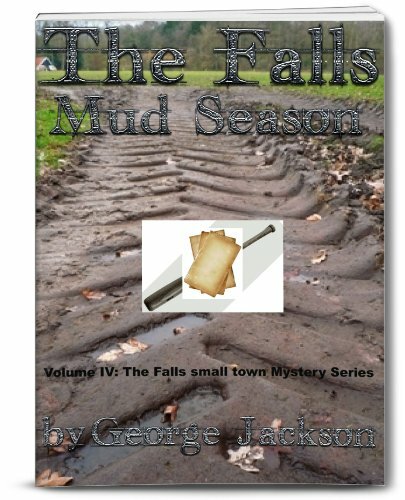 Revisit The Falls during the fifth season of the year, and try not to get stuck in the mud! LOL. What a funny comparison — an plowable field to a kissing booth! This sounds like a book I’d like. My Teaser is from THE HUSBAND’S SECRET.